In a medium bowl, thoroughly mash strawberries with a fork. Add all remaining ingredients except almonds. Mix until uniform. Top with almonds. 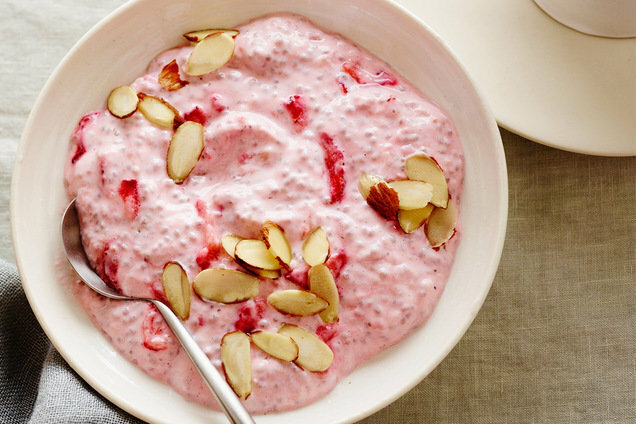 If you like, refrigerate until chia seeds have expanded and yogurt has thickened, about 3 hours. Hungry for More 5-Minute Breakfast Recipes? Help your pals make breakfast in a jiffy! Click "Send to a Friend" now.